In this country everything lifts the trees, the mountains, the sky. Gene Kloss called herself a New Mexican at first-sight, falling in love with the vast, beautiful desert. She was on a camping honeymoon trip in 1925, having recently married poet-composer Phillips Kloss. In Taos, the couple rented an old adobe where they lived part-time for a decade, paying ten dollars a month, and hauling water from a spring a mile up the canyon. In Taos in the summertime, Kloss made prints on a 1,080 pound secondhand Sturges etching press; these intimate and enchanting compositions of New Mexico defined her career. 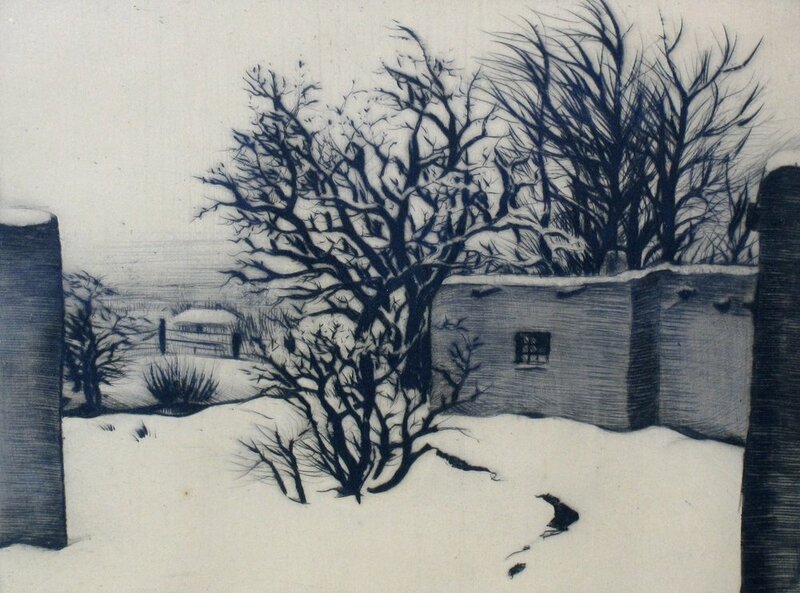 During her 70 year career, she created more than 600 dramatic images with her masterful command and range of intaglio technique including etching, drypoint, aquatint and soft ground producing almost 18,000 prints herself. Please visit the gallery to see works by this inspiring, prolific artist.